Bought a Arsenal Milled SAM7R-61. Cut the hand guard retainer (the sling loop off) so that I could fit the Midwest extended rail. Got everything on right, but it looks "crooked" to me where receiver meets rail. I cant get the bottom half to square up and run perfectly parallel to the barrel. The retainer is in the way. Can you/Do you see the "bow" in the middle where the receiver meets the rail? To me, it appears that the hand guard retainer is not allowing the rail to even out, and creates the un evenness. What would happen if I remove the retainer completely? Do you have to have it to run the gun? The MI has that adapter that bolts the bottom rail and top rail in the middle with a brace/bracket that goes around the barrel. The rails do have contact with the retainer, thus making a point of contact and giving it strength, but also is the problem making it uneven. Im curious if I did remove the retainer, if the rail would then even out and meet the receiver better and run parallel with the barrel. 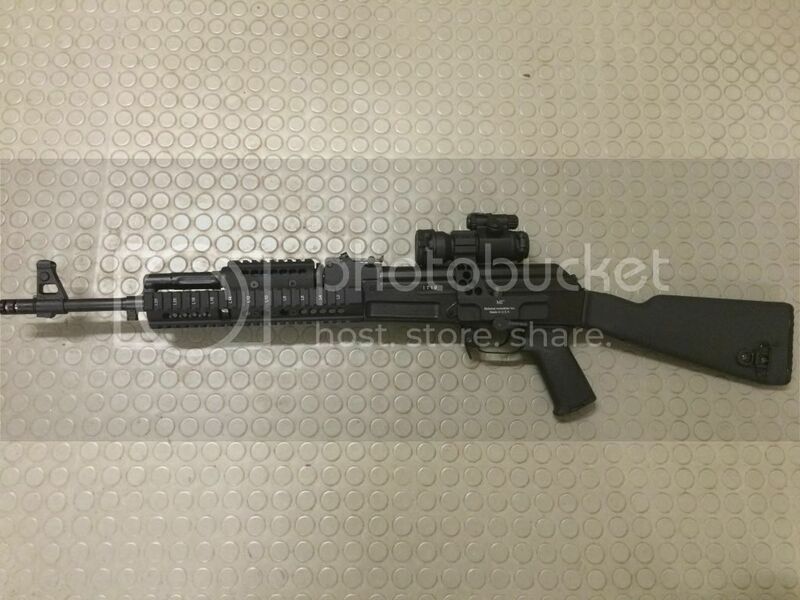 I'm guessing you probably might have to remove the handguard retainer completely, but no way I personally would have hacked off even the sling loop, much less the whole retainer for that piece. You're gonna lose a lot of value of the rifle by doing so, and it will be a lot of work and expense to put one back on. As mentioned above, there's a number of rifle/handguard combos that have this issue to a certain degree, the factory handguard on Veprs (and most aftermarket one) have that downward tilt to a greater or lesser degree, I have to mod mine to restore the parallel look that you're wanting, and i'm with you on this as I like mine to be parallel and flow with the lines of the rifle. If you are looking for rail space to add accessories, the new keymod piece about to be available from Manticore looks awesome, and doesn't require mods as it works with standard retainer hardware. Removing the hand guard retainer completely won't help. That's just how they look. I've asked MI to address the deficiencies in their product, but to no avail. People keep buying their AK-related junk so there's no incentive to fix it. This is why I'll be buying Manticore's product when the time comes.